The Dachau Concentration Camp Memorial site is set up to educate with as much clarity and sensitivity as possible while also memorializing the tragic brutality that this ground witnessed. 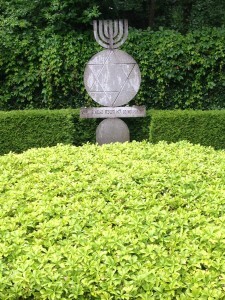 There are multiple sculptures, plaques, monuments, etc. that commemorate the victims and the crimes perpetrated. Newer buildings are on site as memorials, sponsored by multiple faiths that had clergy/leaders/members in the camp, including obviously a Jewish representation but also Catholic, Protestant, and Russian Orthodox. One of the buildings is currently in use as a nunnery. There is no minimizing, dodging or obfuscating the role of this camp, the first concentration camp, in setting the tone for other camps. Everything that was done elsewhere started here. Given all the things I saw as testament to the crimes and death that occurred … what is really a struggle for me is understanding how vast the network of camps and sub-camps was. We were shown a map of the territories held by Germany at the peak of the war and the map was filled with literally hundreds of locations where versions of this place, in smaller and larger scales, were located. We have heard only of a handful of the usual names – Auschwitz-Birchenau, Treblinka, Bergen-Belsen, Dachau. But there were literally hundreds of camps and sub-camps. I was aghast at the breadth and scope of barbarism undertaken across such a wide geographic area. During my visit, it was (mostly) quiet. People were respectful and clearly there to learn, to try to comprehend, to absorb. Entrance to the site is free. I’d estimate there were a few thousand people there while I was there, so it is well used. There are lots of trees around the exterior of the camp proper, and thus lots of birds singing. That seemed out of place, as if the birds should know better. It poured rain, on and off, and that seemed entirely in keeping with the mood. Our tour group had 15 high school kids from Indiana and it was interesting to watch them go from being “too cool for this” and sort of detached to being really quite sober. I overheard discussion of the use of this memorial site for school groups and it appears that schools from all over Europe and North America make stops here. That feels like a good thing, but it does make it a bit of a challenge for maintaining the appropriate decorum when pre-teens and teens are responding to what they see with humour or (feigned) apathy. I think Dachau has an impact on everyone who visits and I think it is important for as many young people from as many different backgrounds as possible to see it – and I also think that kids don’t always know what to do with their emotional responses “in the moment”. It felt oddly synchronous to be looking at the actual original pink triangle symbol, as deployed to identify a homosexual “enemy of the state”, the day after World Pride had wrapped up in my home city of Toronto. 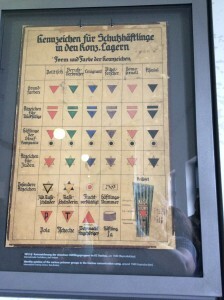 There is no more clear reason to justify the existence of an event like “World Pride” than standing in an original building at Dachau and looking an original wall chart of symbols used to identify people, one of which was a pink triangle. Interestingly, there is a committee of survivors that has a crucial role in determining the types of memorials that will be allowed. 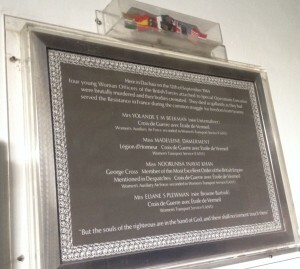 A memorial focusing on homosexuals is absent because, in the hierarchy / social structure of the camp at the time, homosexuals were at the bottom of the barrel along with known criminals and other “asocials”. The committee of survivors isn’t comfortable acknowledging the targeting of homosexuals by approving a memorial for this group. When I spoke to our guide about this privately, he suggested that people were waiting for the committee of survivors (which is quite small now) to hand over their legacy to perhaps a more current committee with a more current perspective. I would have liked to have seen something there as an acknowledgement that gay people were one of the many groups identified as “enemies of the state” – and I also think this can wait until the time is right. Homosexuals are identified within the part of the exhibit that describes all the targeted groups, and our situation is given as much detail and focus as most of the other groups. I took only a handful of pictures. It didn’t seem … seemly. Dachau is just outside of Munich and the typical journey one takes to get there is from the Hauptbahnhof (main train station) in Munich. It is a short 10-15 minute ride. German citizens in Munich are extremely sensitive about people coming to visit to learn more about Nazis and about concentration camps. I knew about specific laws around giving an Nazi salute (even in jest, this will get you arrested) and I didn’t realize Mein Kampf was still a banned book. It was odd to be taking a tour with a group to specific sites relevant to WWII and to be scrutinized by the locals. They will listen and try to be sure the guide isn’t Munich-bashing or sensationalizing. Locals are also concerned with Neo-Nazis using specific sites as touchstones for their own purposes. As much as they don’t want their quite beautiful city associated with the rise of the Nazi party, as it happens, this is now a key part of the city’s past. Never mind that the PLO leveraged this association with the murders during the Olympics in 72, which adds another horrific piece to the global perception of Munich. I don’t want to suggest that Munich has had a bad rap – it is what it is – but it is a pleasant place, rich in layers of history beyond the 20th Century, walkable, reasonably friendly – I quite enjoyed it. been left, on purpose, unrepaired, in the architecture, like reminders. Scars. You have to look for these, but they are there. A more deliberate, striking example is a metallic (gold? bronze?) shimmering trail down the cobblestones in an alleyway known as Dodger’s Alley. 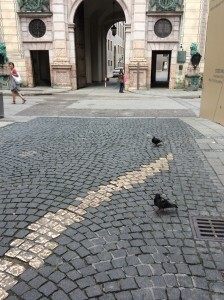 In the 30’s/40’s, citizens of Munich who walked by a specific Nazi plaque on the corner of one of the main squares had to give a Nazi salute or be arrested for not doing so. There were lots of people who didn’t want to give a Nazi salute. So, to avoid walking by that plaque, many would take a detour down Dodger’s Alley. Nazi authorities caught on to this and started policing the use of the alley, interrogating people found in the alley as to their purpose for being there. If no satisfactory purpose was offered, a person would be thrown immediately into Dachau. Just for taking a detour to avoid giving a salute. Even these people were “enemies of the state”. As to the metallic trail, there is no plaque or explanation. You need to just know, or be told, why it is there and what it signifies. Apparently, there are lots of these sorts of things all over the city, commemorations of resistance. I didn’t have time to go find more, unfortunately. I will close by noting this plaque. It is almost hidden behind a door that leads from the gas chamber into the crematorium. (Please don’t imagine that I typed that sentence with any degree of casualness.) There is a railing in place, making it harder to get a straight on, close photo. Since it is hard to read, I’ll type out what it says here. They gave their lives – the least I can do is try to get this right. served the Resistance in France during the common struggle for freedom from tyranny. Bravery, compassion and a complete and utter focus on their missions, to the exclusion of all else, including their own lives. 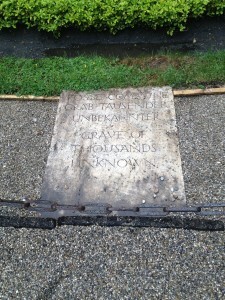 This was a surprise find towards the end of my visit to Dachau – but it shouldn’t have been. I feel like I should know these names and that I should know more about these stories. Their world, a world in which their skills and dedication were needed at extreme cost, is not that far removed from our current time of social media, popular culture, ridiculous fads and trivial pursuits.